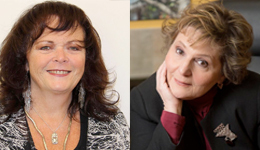 York University researchers Professor Carla Lipsig-Mummé and Professor Andrea O’Reilly in the Faculty of Liberal Arts and Professional Studies (LA&PS) are shortlisted for the prestigious Social Sciences and Humanities Research Council (SSHRC) Impact Awards. The Impact Awards identify the highest achievements of SSHRC-funded research, knowledge mobilization and scholarship. Lipsig-Mummé, who teaches in the Department of Social Science, is a finalist in the Partnership category. The Partnership Award recognizes an exceptional formal partnership that generates impact and influence within or beyond the social sciences and humanities research community. O’Reilly, who teaches in the School of Gender, Sexuality and Women’s Studies, is a finalist in the Connection category. The Connection Award is granted to a person or team whose project engages the campus community or beyond and generates intellectual, cultural, social or economic impacts. Lipsig-Mummé is an expert in work and labour studies and leads the Work and Climate Change (WCC) international, community-university network partnership, which has grown from five partners and eight researchers to 52 partners over the past two decades. The WCC addresses the intersection of climate change and the working world. The WCC plans on promoting “just transition,” a term that refers to the global goal of balancing the transition to low-carbon economies while protecting and bettering jobs and work for all workers, as well as providing for those workers who lose their jobs in the process. O’Reilly is an expert in feminism and motherhood. She is the publisher of Demeter Press, director of the Motherhood Initiative and editor of its journal. She was nominated for being the global leader of the Motherhood Movement and founder of matricentric feminism. Over the past 20 years, she has mobilized researchers from more than 400 universities and activists from more than 100 motherhood organizations to establish maternal scholarship, motherhood studies and the International Mothers and Mothering Network. Her pioneering work has established motherhood studies as an independent academic field with more than 50 new courses taught at universities around the world, and with hundreds of scholars identifying maternal research as their scholarly field. The 2018 Impact Award winners in all categories will be announced Oct. 3 at Rideau Hall in Ottawa.